The Unlikely Boat Builder: Lost! On the same day I broke out of my trap in the marina, I learned another important lesson. Personally, I think 2 lessons in one day is excessive, but King Neptune must have realized he was running out of time, too. It was the middle of the afternoon. The wind had died down, but it had been replaced by light rain and fog. In some places, the ICW runs through rivers or canals. The main navigation problems are staying awake (so you don't suffer the embarrassment of running your boat up on one of the banks), and watching for the occasional well-marked fork in the road. But in other places, the ICW winds its way through wide expanses of shallow bays, low grass-covered islands, and marshland. In the best parts, there are no signs of human habitation. And on cold, foggy weekdays in November, there aren't even any other boats. You are all alone out there, with only the occasional red or green buoy to show you where the thin track of the ICW leads. Of course, the ICW is only one 'trail' through this wilderness. There are other trails, that go other places. Some of them lead out to inlets and the Atlantic Ocean. Others lead into rivers or harbors. The wide, trackless bays are sometimes crisscrossed with these trails, and its easy to get confused. This is particularly true when fog or rain limits visibility, because you might only be able to see the closest markers. And at times, you can't even see those. At times like these, you either anchor and wait for the visibility to improve, or pull out your GPS chart plotter. When I started this voyage, I considered chart plotters to be 'cheating'. 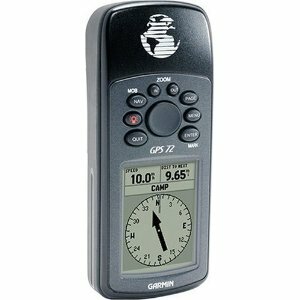 I did have my simple Garmin 72, but this GPS has no usable maps. It mainly just shows your Latitude and Longitude. It's like an easy-to-use sextant. You need to plot your position on a real chart. But over the summer, I upgraded my iPhone to a 3GS with built in GPS. 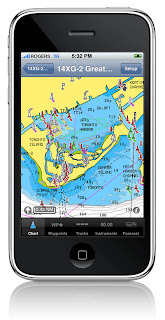 With the amazing Navionics app, I had a hand-held chart plotter with me when I left Jacksonville. This was not a luxury. The ICW from Ft. Meyers, through the Okeechobee, and up to Jacksonville is mainly the river/canal type of waterway. You don't need a chart plotter to stay in these sorts of channels, anymore than you need a chart plotter to stay in your lane on I-95. But once you get into the marshland of southern Georgia, a chart plotter isn't only nice to have, it's pretty much a necessity for a deep-keel boat. The reason is simple: the ICW is narrow and the red and green day markers are too far apart, in many places. It's often impossible to tell exactly where the channel is just by looking at the water. In these situations, a modern chart plotter -- which shows you your location to within a few feet -- can keep you in the channel, and off the shoals. Assuming the chart is correct, which it is, mostly. So there I was, motoring at a stately 4 knots, visibility about 1/4 mile, with low grassy islands all around me, playing 'keep the red arrow inside the channel' on my iPhone. This is a pretty simple game at 4 knots. The red arrow showed my location; the head of the arrow showed my direction of travel. At any rate, it was rude shock when I abruptly ran aground, a half-mile at least from the nearest visible shore. I don't mind getting aground in protected water, but it's no fun at all being aground in the middle of a bay, with a couple miles of fetch in several directions. Its all too easy to imagine the nasty chop that would pick up in a hurry, if the wind started to blow. That's why I made it a rule to only travel on a rising tide in the NJ ICW. Also, to run at a reasonably slow speed, so I wouldn't run 50 feet up a sand bar if I hit one. In fact, I was able to back off this shoal in a few minutes. Then, paying attention this time, I tried to resume my course. Bump! Aground again, even though the chart plotter showed I was smack in the middle of the channel. This had happened before, of course. Channels get shoaled up, or they move, or the chart isn't exactly right. Yes, hard as it is to believe, sometimes the chart isn't as accurate as the GPS. The mistakes are rare on as traveled a highway as the ICW, but they do happen. I'd found a couple other mistakes the hard way, but this was different. Those other mistakes had been in well marked channels. Here, I was in the middle of open water. The next channel marker was at least a quarter mile away. I could just about see it through the fog and drizzle. Yes! That must be right! I carefully motored towards the new pair. No problem. I passed between them, and then looked towards the #26. I didn't see any markers between me and the #26, so guessed the idea was to head right for it. Not lost in the sense that I didn't know where I was. I had a GPS that told me exactly where I was. But I was totally disoriented, in the fullest meaning of the word: what I was seeing with my own eyes seemed totally different to what I was seeing on the chart plotter. The small size of the screen probably contributed to the problem, although it hadn't been a problem for over 1000 miles. The fog added to the problem. A line of buoys conveys a lot more information than a single buoy. The line not only shows you where you need to go, it often tells you what direction you need to approach from. That single buoy told me "you need to pass me", but it didn't tell me HOW I was to get there from where I was. That buoy was surrounded by shoals. Of the 360 possible lines of approach, only one was right. The best thing to do when lost or confused on the water is to anchor, if at all possible. Nothing could be easier than anchoring where I was, in 5 feet of water. I went below, and made a cup of tea. Some people might have had a stiff drink, but I find a cup of tea clears the mind better. After the first brain-clearing sip, I did what I should have done a long time ago: I pulled out the old-fashioned paper chart. Within a few seconds, I realized my mistake. I was in the wrong channel. Instead of being in the ICW, I was in one of those cross-trails that lead to an inlet or river. I could not tell you, even now, how I got there. I wasn't very far into it... just a couple hundred yards. But between me and the old #26 was a 1' deep shoal. I could have nosed around all day and never found a way through. I carried my tea and chart up on deck and looked around. There were the two buoys clearly marking the wrong channel. And there, a couple hundred yards back was the #25, where I'd made the wrong turn. I wish I had taken the time to look at my chart plotter at that moment. I would love to see what it said. But I was so happy to be re-oriented, that I didn't take the time. I hoisted my anchor, went back to the #25, and cruised past the #26 without a bump. Even then, it was hard to understand how I'd gotten so utterly lost in such a simple situation! Upon reflection, I think the problem was a matter of scale. The GPS chart plotter is excellent for showing you what I will call, for lack of a better word, the detailed picture. You can zoom in as close as you like and see where you are in the -- or should I say a -- channel, within a few feet. What it does not show very well is what I must call the big picture. As you zoom out on a chart plotter -- particularly a small one -- you lose detail. Since I normally kept both chart plotter and paper charts on deck, I'd always had the benefit of seeing both the big picture and the detailed picture. But since it had been a rainy day, I'd left my chart below to keep it dry. It only took a moment's inattention to get into the wrong channel. My zoomed-in GPS showed I was in the channel. What I didn't see, until I could see the big picture on my paper chart, was that I was in the wrong channel. If this sounds confusing, it's because it was confusing. I'm telling you the story as I remember it, and as I believe it happened. I can't say for sure how it happened. This is my best guess. People who are lost can rarely say how they came to be lost. That's sort of the nature of being lost. You only know you are lost when you are! But I do think I am right about the big picture vs. detailed picture thing. Its not that one is good and one is bad. It's that you need both. You need both the big picture and the detailed picture. I'm just lucky that King Neptune taught me this lesson in so gentle a way. Just a few soft bumps on a rainy afternoon, and a little confusion. Yep, know the feeling. It's really strange and highly unwelcome ... and it is worse if you're in a place where you don't understand the language. Backing out to the bigger chart, the larger subway map, I discovered another very large station (again 9 or 10 lines) just a short distance away. I was in the wrong station. Needed the bigger chart. It was my only lesson that day. One was enough. Still feel the near panic when I think back about it. What's amazing is how you can rationalize away the evidence of your own two eyes. If the computer and your eyes disagree, the computer must be right, right? I can relate. First trip in the ICW I was using the hand held GPS cause the new chartplotter was not yet installed. Following the red line dead on resulted in a trip up a branch. I suspected something when it seeemed to get narrow and I noticed a highway with w bridge the boat would not fit under let alone the mast. I fine gentleman came out on his dock and confirmed I was up a creek. Only my 4.5' draft allowed us to venture so far to nowhere. Perhaps the the mud churning towards the end was the first indication. Managing a turn around to reverse course and heading back out I discovered that bright red line was the county line. Thanking Neptune for the lesson I have since installed the charplotter and purchased paper charts. Live and learn. As you noted, it could have been a lot worse, happily no damage was done to anyone/anything. As to the apparatus you were using, chart on a cell phone, your screen is what, a couple of inches x a couple of inches. There is or would be a very large margin, as you discovered, for loss of inportant details. Also knowing virtually nothing of this sort of equipment, how clear a picture do you get, even of the small area displayed on your phone's screen. Yup sounds all too familiar. We got spun around in Lac St. Louis a few years ago. I always have a laptop setup with scaled in and scaled out charts for the big picture. Thnx. for the story. Yes, any chart plotter at all is better than none on the ICW, if you have a deep draft boat. You can do it without one, but you will run aground more often. There are just many places where the day markers are not sufficient to show where the channel is. That said, I really enjoyed the ICW. There are many parts of it that are really beautiful and wild. You'd never guess how wild the east coast of the US can seem from a boat. You know that civilization is just a few miles away, but it often feels like you are in the middle of no where. It's also a very LONG trip. I've barely touched all the adventures that occurred along the way. I think I skipped over South Carolina, altogether! Definitely worth doing at least once. Enjoying the post and the comments! A friend put the Poole Fairway buoy in his integrated GPS, plotter, autohelm in fog - you guessed they hit it dead centre at 6 knots - could have been much worse but they lost the mast. There's a lot to be said for the manual step between position and plot and of course relating that to where you are/think you are.